The European Foundation for Immunogenetics) was formally founded in March 1985, and is registered in the Register of Associations. Lt Gen Gopal R, UYSM, AVSM, SM, President EFI presenting a Trophy to Mr Amar Sarin. In our continuous efforts to make an automation process in place recently we have integrated our website with an online payment g/w, so that you can make different payments online e.g. 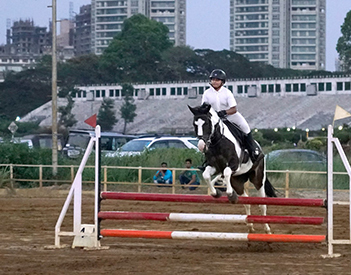 horse registration, riders registration, NOC Fees, Annual Subscription, FEI Passport/recognition card etc., for this Link to online payment has been integrated on Website home page itself, so you just have to go there and click to make on line payment. In our continuous effort to let you connect with latest tools and platforms so that you can stay updated and connected with EFI, In this ongoing effort we had launched and now upgrading our existing EFI Software platform for all users connected with us. and we have created your Account on EFI Software Platform as well, where you can login on the regular basis, and check your account related information on EFI Software Application, and you can also check an upcoming / Past Events, competitions details. All results sheets, officials detail, riders/horse searches are accessible to you now. We are connecting you with our Software Platform, "NFIT" where you can login and you can able to access all games/rider/horses/results etc. related information in one single click. Now you can stay connected with EFI for Instatant Messages, Latest News/Updates and latest happenings with EFI Mobile App, and it can be downloaded from Google Paly Store with a name "Equestrian Federation of India"